In order to reward the players who are following us till the beginning of our project, we have decided to offer an exclusive variant on Sukane : “Evil Sukane”. For the record, this variant is currently under way in our internal demo, in order to simulate the ennemies. This is therefore a special colour for the character, which will be available for a limited period of time. To win Evil Sukane and follow the evolution of Samurai Riot, you only have to click on the image below and you’ll find the procedure provided for receiving our Newsletter. Come here to vote for our giant cat in the running for the Facebook contest “Ma bulle” on the theme “Un jour peut-être” (“Maybe one day”). 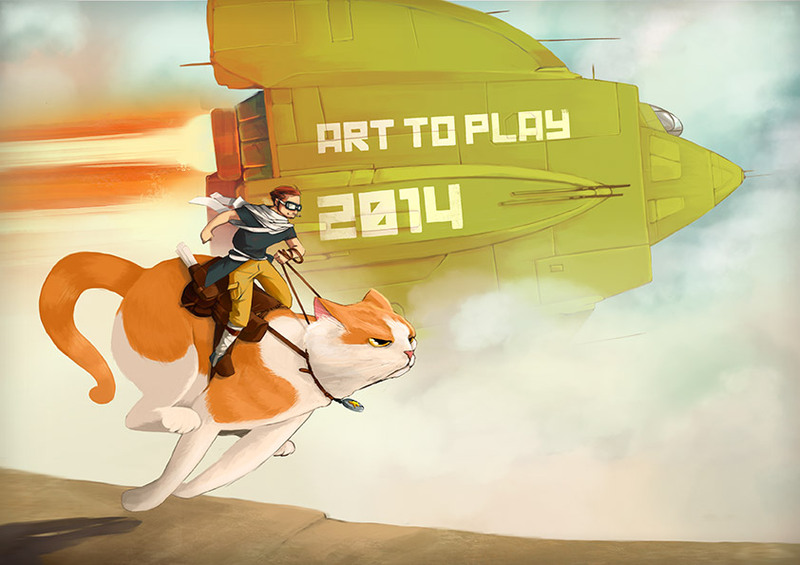 The Wako Factory team will be present at the “Art to Play” game fair in Nantes, on November 22nd and 23rd 2014 so as to present our new game Samurai Riot : we’re waiting for you ! To vote, go and “like” our image by clicking on it or on the button below. 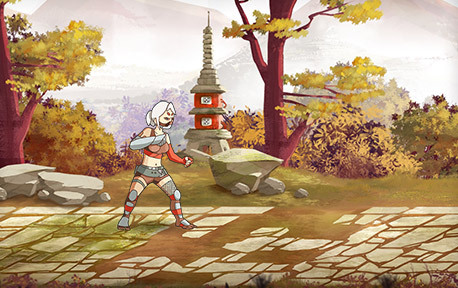 Today, we’re going to talk about one of the playable characters in Samurai Riot : Sukane. Enigmatic ninja, Sukane has a very deep connection with the Spirit World. Despite coming from a foreign clan, she’s been hired for some obscure reasons so as to bring an end to the civil war raging in the whole country. Always very secretive, no one really knows her personal reasons. Why has she left her clan, located in the Spider Forest and how will she react when she is able to overthrow those in power? As many questions the answers to which your actions will depend on! Until then, we invite you to join us on our Facebook page, as well as to subscribe to the RSS feed in this blog. See you very soon for more information about Samurai Riot! Hello everyone !After long hours of work and research, we are proud to present to you the final rendering of the first game setting : “The pilgrimage path”. This path will be located at the “Shogun’s mountain” level and will follow the Imperial Highroad leading to the Castle of the Clan. We invite you to join us on our Facebook page, as well as to subscribe to the RSS feed in this blog. See you very soon for more information about Samurai Riot ! Wako Factory is the project of a studio for creating cooperative games in Nantes. We have begun the pre-production of our first game : Samurai Riot. Beyond the 2D arcade side of our Beat-them-up game, we wish to have a modern visual rendering, with sprites in HD and a rich and innovative gameplay. At the border between the real traditional Japan and science fiction, the game will offer the adventure of a small group of samurais in the midst of a civil war where tradition and modernism confront each other. The blog and Facebook page are open ! Wako Factory is proud to announce the official opening of its “Development blog”, as well as its Facebook page. The blog will shortly be hosting all the latest news about Samurai Riot, including screenshots and video presentations as we go along our furtherance on the game production. As Samurai Riot is currently in pre-production, we will unvail in the coming months a lot of “proprietary” information, until the first official trailer arrives, probably around May 2015. Until then, we’re counting on you to monitor closely our progress by using the RSS feed of this blog and adding a little “like” at our Facebook page !